“Plus ça change, plus c’est la même chose,” goes the French saying: the more things change, the more they stay the same. Anyone looking at the current debate on Germany security and defense policy would come to a similar conclusion. While Germany’s security environment has fundamentally changed over the past years, the main features of German security policy have not. On the decisive questions, the German debate is going in circles. At first glance, this diagnosis may be irritating. 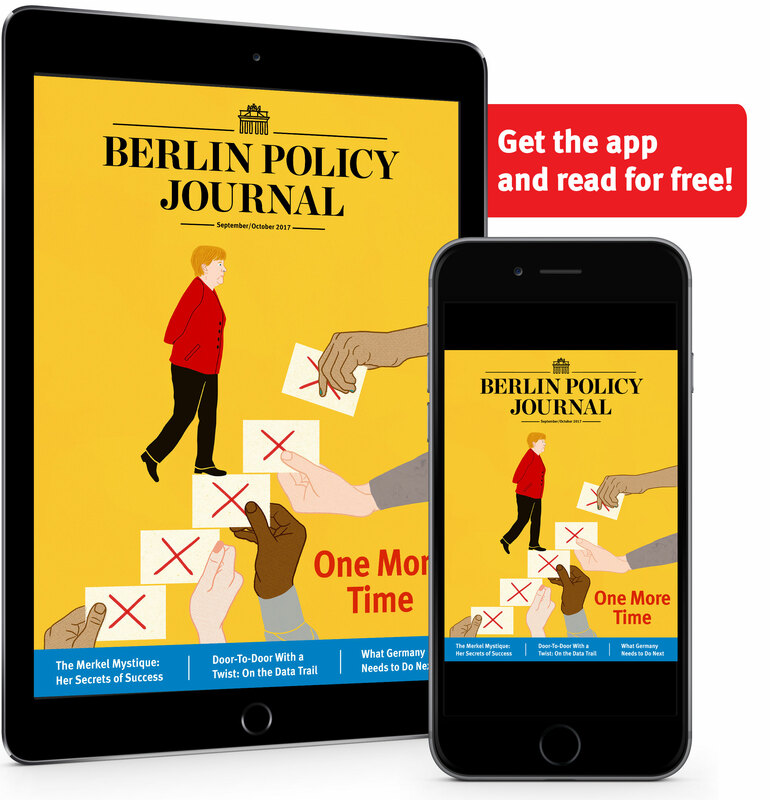 After all, for years Germany’s partners had urged the country to get more involved in security policy, and in early 2014 their efforts paid off. At that year’s Munich Security Conference, the new grand coalition and the federal President sent out a clear signal: Germany’s participation had to “come earlier, be more decisive, and be more substantial” in order to maintain and shape international security. “Assuming more international responsibility” was also supposed to mean a German defense policy that was more effective and more capable of action. And indeed, the promises of reorientation proved to be more than warm words. In reaction to Russia’s illegal annexation of Crimea and the hybrid war Russia launched in eastern Ukraine, Germany showed great commitment. In the wake of Russian aggression, the German republic took on, for the first time in a post-war security crisis, the diplomatic leadership of the West. At the same time, it confirmed its dedication to NATO. The rise of Islamic terror in the Middle East and Africa also brought resolute action. In 2014, the German government was prepared, without great debate, to support the Kurdish Peshmerga with weapons and ammunition for their fight against the Islamic State. In doing so it said goodbye to the decades-old principle of not delivering weapons to warzones. After the terror attacks in Paris in November 2015 and France’s activation of the EU’s mutual defense clause, the German government took less than a week to secure parliament’s approval to take action. It made available up to 1,200 soldiers, six Tornado jets for reconnaissance, and a German frigate. And within the framework of the UN’s MINUSMA Stabilization Mission in Mali, Berlin expanded the previous German engagement into the north of the country, thereby taking on a bigger security policy risk than in any previous Bundeswehr training and observation mission in Africa. Nevertheless, Germany’s allies welcomed Germany’s greater engagement, taking it as a sign of an increased political will to militarily bear a level of responsibility for world peace and international security commensurate to Germany’s position as the biggest and most powerful country in Europe, a burden consistent with the benefits (not least economic) that the Federal Republic has received from the military operations of other countries in the past. It seemed as if Germany—if only hesitantly and well below its defense policy potential—had begun to develop a new understanding of itself. Slowly but definitively, it was saying goodbye to its role as a “free rider” and “net importer” of security. Germany even came to the unpleasant realization that the Bundeswehr’s equipment problems couldn’t be solved through “pooling and sharing” with partners alone. After years of cuts and stagnation, in 2016 the grand coalition signaled a turnaround in defense spending. However, by the time the campaign for the 2017 federal elections began, if not earlier, it was evident that the incipient security policy adjustment process was already over. At least that’s what current developments suggest. Rather than discussing how and at what price Europeans could provide their own security in the future if the United States was no longer fully available as the continent’s guarantor, Germans focused on the supposed “Trump edict” that NATO members must spend 2 percent of their GDP on defense. No one wanted an objective analysis of the new threat environment and the new tasks it required of Germany’s armed forces. 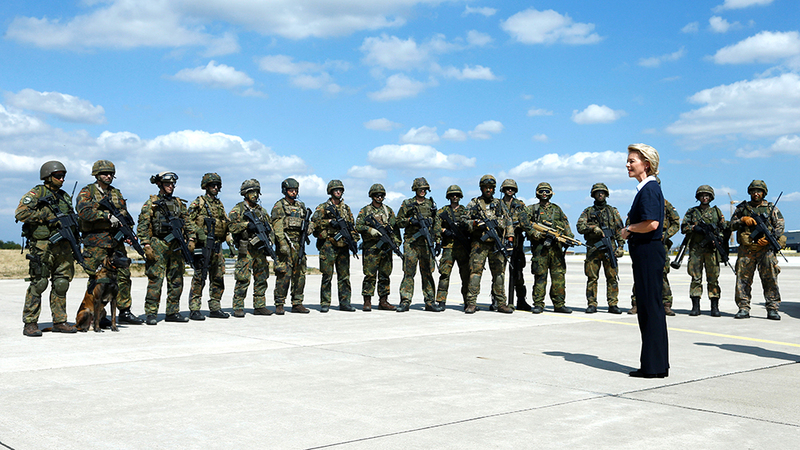 Little attention was paid to the Bundeswehr’s miserable equipment and catastrophic administrative failures, or to the defense spending commitments that the grand coalition had made to allies at the 2014 NATO Summit in Wales. Motivated by ever worsening polls, the Social Democrats were the quickest to identify pacifism as a campaign issue with which they could distinguish themselves from the conservative Union. With this in mind, the SPD candidate for chancellor, Martin Schulz, rejected a “logic of armament demanded by the United States.” And Sigmar Gabriel, at the time the German Foreign Minister, wrote an article in the Rheinische Post with the title “Weapons Don’t Create Security.” Germany had to “remain a power for peace, not become a military arms machine.” It was necessary to “stand against any subjugation to the militarization of foreign policy led by Donald Trump.” The Greens and the Left party, too, rejected the NATO 2 percent goal or indeed any spending increase for the Bundeswehr. This controversy over the defense budget was no campaign-related flash in the pan. No, it endured and found its way into the third iteration of the grand coalition and its budget negotiations. But instead of using the opportunity to have a sensible, wide-ranging argument about which security policy goals Germany should pursue in light of the new threats, about which commitments it has already made and which resources it needs to make available, German politicians these days prefer to fight against the “arms race in the defense budget” (SPD leader Andrea Nahles). It feels as if they are dragging the German debate 20 years into the past. Yet now is the time to present to the German public what it means for security and defense policy if—as the chancellor says—“the times in which we could completely rely on others” are “somewhat over”, and “we Europeans have to take our fate in our own hands.” Yet the Bundeswehr cannot even meet the demands currently made of it. Since the Chancellor made her “beer tent speech” at Trudering, where she made those comments about Europe’s need to defend itself, no one has heard anything concrete from her office apart from a reference to progress in the area of Europe’s Common Security and Defence Policy (CSDP). 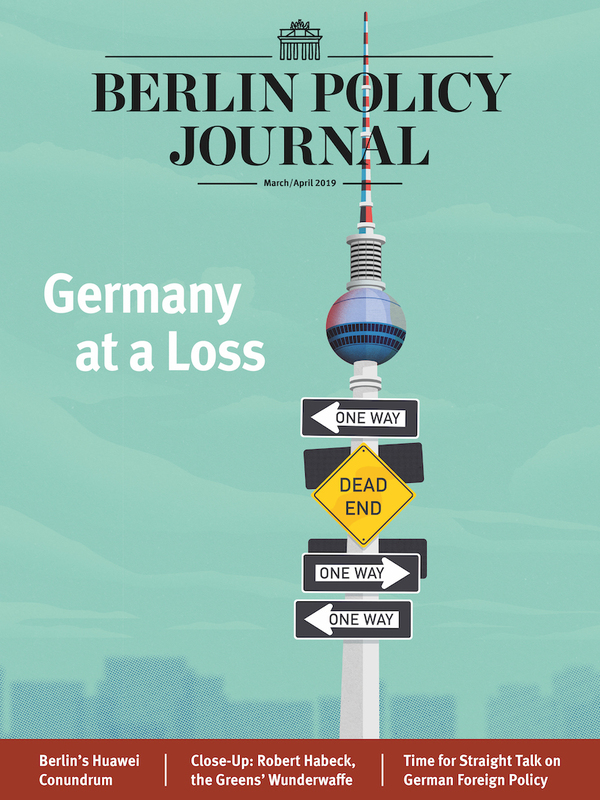 It is not just the vexing debate about money that shows that the new German policy regarding security and responsibility is again—or rather still—dominated by old reflexes. In the area of CSDP in particular, the government has recently pushed forward with a number of initiatives. But at the same time, these demonstrate that Germany is focusing less on defense as such and more on EU integration. Permanent Structured Cooperation (PESCO) is a good example of this: France wanted to raise Europe’s strike power; the goal was greater strategic autonomy. Germany wanted to get as many member-states on board as possible and to create connecting structures and processes. Thus for Germany, to France’s frustration, operational ambitions were secondary. It was only with great hesitation that the German government joined the French-initiated European Intervention Initiative. That the Germans have an inconsistent relationship to using the military as a political tool became clear again earlier this year. When the Assad Regime once more turned to poison gas as a weapon, the United States, Britain, and France responded with airstrikes. Without even being asked to participate in the bombing, the German government ruled out any involvement in the military operation. Yet at the same time, the chancellor explained “everything possible is being done in order to demonstrate that the use of chemical weapons is unacceptable,” and guaranteed to Germany’s allies her government’s full solidarity. This all illustrates how much the Federal Republic continues to struggle to find its way in a world that no longer plays by the rules of the 1990s, in which power is replacing international law, and conflicts are once more being resolved more violently. To limit the German contribution to international politics to “diplomacy, humanitarian aid, and development cooperation” (Martin Schulz’s Twitter suggestion of July 13) is not at all a convincing strategy given the world situation. If the world gets the impression that Germany, in security policy terms, would rather go backwards than take the next step forward—for example if a lack of funding forces the cancellation of already agreed joint armament projects with France and Norway, or the reversal of commitments made to EU and NATO partners—Berlin risks losing an immense of amount of trustworthiness and credibility. But those words were followed by Germany’s unilateral “No” to the Iraq war; the rebirth of a “culture of military restraint” (Guido Westerwelle); and an abstention in the UN Security Council when it came time to vote on whether to live up to the “responsibility to protect” in Libya, paired with a total rejection of any German participation in the following NATO military intervention. However justified any of these individual decisions may have been, the allies got the impression that the primary motivation for the Germans was to win elections and avoid alienating the voting public. Where is the Strategic Debate? A sustainable adjustment of the German strategic culture to political reality will be imposible until decisive questions are openly discussed and honestly answered by politicians. Such a strategic debate, one that doesn’t avoid uncomfortable questions, has not so far taken place, at least not beyond a few circles of experts. There is still nothing like a common understanding of what “new responsibility” is supposed to mean in concrete terms for Germany’s security policy ambitions, not among politicians and their parties, nor among the ministers, and certainly not among the wider public. That is why self-descriptions like “supportive power” (Anlehnungsmacht), “shaping power” (Gestaltungsmacht), or “reflective power” (nachdenkliche Macht) are mainly feel-good terms without substance. They will remain so as long as it remains unclear what Germany would like to use its military power for. Anyone who argues that this question was cleared up by the Defense Ministry’s 2016 White Paper or the July 2018 “Bundeswehr Concept” has clearly forgotten to tell the relevant politicians and the public. A gap still gapes between which security policy actions Germany finds necessary and supports (not infrequently the military engagement of friends and partners) and what we Germans are prepared to do ourselves. We have to talk about this. This summer again, the Federal Republic has ignored this discussion in favor of phony debates about the reintroduction of mandatory military service or a German nuclear bomb. The former debate was above all about how great it would be if every German made a contribution to society, while no attention was paid to whether mandatory service is necessary or evven sensible in terms of security. And as important as it is to talk about a German nuclear strategy, it would be better for people to talk about what’s on the agenda for this legislative period: Germany’s nuclear participation in NATO. After all, the outdated German Tornados, which Berlin keeps ready to transport American nuclear weapons, will be taken out of service in 2025. Meanwhile the plane foreseen as their successor, the Eurofighter, is not yet nuclear-capable, and the fighter jet Germany is planning to build with France won’t be ready until at least 2040. There’s plenty of material for an honest discussion about Germany’s position on nuclear weapons—if we actually wanted to have it.